The FBI team must deal with a hit man. How will Jane face the possibility of Lisbon getting hurt? 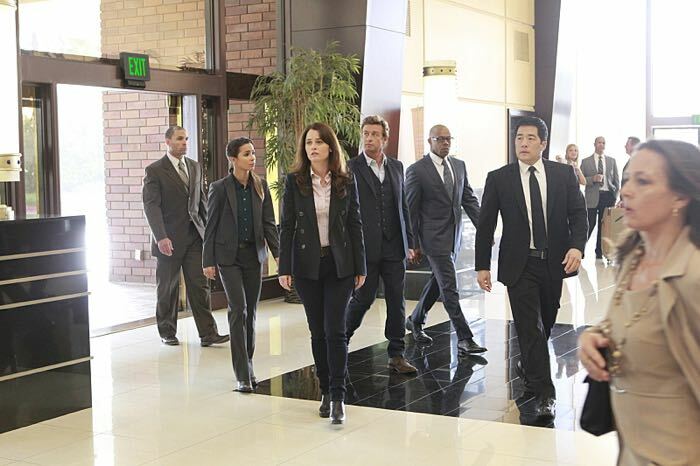 Read on for our recap of the new The Mentalist episode, “The Whites of His Eyes”. Jane and the FBI team must protect a key witness in a murder investigation from a hit man, who wants to get rid of her. Thanks to a well executed plan, and a great teamwork, Abbott’s team is able to save the witness’ life, and the hit man is no longer a threat. This new episode of The Mentalist was very rich in parallels, and it showed a lot of insight into the characters’ personalities. Let’s start with Vega and Wylie. Those two together are the epitome of the word adorable. Their relationship is getting closer with every new episode. They’re playful, they enjoy each other’s company, and when I saw them playing video games together, I couldn’t help but think about Jane and Lisbon playing foosball at the beginning of the episode. Same as Jane slowly smoothed Lisbon’s hard facade, so is Wylie doing with Vega, making her feel comfortable in her new workplace. I don’t know what the writers have in store for these two, but I just want to enjoy them right now, as they are, even without any romance (yet) involved. Now onto the “older” version of Vega and Wylie. A version that has a lot more baggage and issues to work on. We first see them on a date, Lisbon kicking Jane’s lovely derrière playing foosball. Never play versus a girl who raised three brothers, wise words from poor exhausted Jane. Fun’s over though, when they have to join the team in the new investigation. Another interesting parrallel happens when the key witness’ husband doesn’t want his wife to go along with her duty as witness. He’s scared the hit man could kill her, he wants her safe. But she decides to give her testimony. Jane knows the husband’s feelings all too well. He went through that once already, and now he’s about to go through it another time. The hit man could kill anyone of the team, including Lisbon. There’s a scene in which Lisbon gets almost shot, the bullet barely caught the surface of her jacket (which reminded me so much of the episode 3×07, “Red Hot”, where Lisbon gets almost shot to save Walter Mashburn’s life, and he sees a hole in her jacket, just like Jane in this episode), but that’s enough to scare Jane, very much. So much that, during the team’s plan to protect the witness, Jane took Lisbon off on purpose, from the team, to avoid any risk of her getting shot by the killer. It’s very important the confrontation they have at the end of the episode about it. Jane says to Lisbon that it was to protect her, and that he would do it again. How is Jane going to let Lisbon free to do her job, and potentially risk her life, without trying to do something? And we’re back to the issue that was introduced at the beginning of the season: Jane would like to leave the FBI, he doesn’t want to live with the thought that Lisbon could get hurt or killed any day. He has already gone through that once, and he wouldn’t survive a second, for sure. As he declared on the plane, he’s scared to let anyone close to him, because that means caring again about someone else. Lisbon on the other hand, has been a cop all her life. She’s a very good one, she knows what she’s doing, she’s a professional, and she’s an independent woman. She’s never been into a serious relationship that would force her to re-evaluate her priorities. But now it is different. Now she has that kind of relationship. I can honestly say that I sympathize with both their points of view. While Lisbon was saying: “You have to let me do my job”, I thought: what if Lisbon’s presence would have saved the life of another team member, and she wasn’t there because of Jane? He’s been “selfish” in a way, choosing to protect her life, but what about the others? On the other hand, just the thought of Jane finding Angela and Charlotte dead is enough to remind me why he’s the way he is with Lisbon. How will they work this out? Will they find a way to reconcile their differences? With just 5 episodes to go before the end of the Series, every episode now will be crucial.